A Stirling manufacturer has gained investment worth almost £37m which will double its capacity and create new jobs. Superglass makes glass wool insulation for the construction industry at its site on the Thistle Industrial Estate. The cash boost will see production double to 60,000 tonnes a year. Russian Sergey Kolesnikov bought the company in 2016 and this fresh investment brings total spending on the site to almost £50m. Mr Kolesnikov is the owner of TechnoNICOL, the largest manufacturer of construction materials in Russia and Eastern Europe. Since Mr Kolesnikov's acquisition of Superglass in 2016, the business has entered into a close partnership with TechnoNICOL and is now a key regional hub for the Russian construction materials giant. Ken Munro, chief executive of TechnoNICOL UK, Ireland and USA, said: "TechnoNICOL's backing is a real vote of confidence in Scottish manufacturing, both in terms of the quality of the work we do here and the expertise of the workforce. "This is a further statement of intent regarding the long-term future of our Stirling operations. "By our estimations, it's also one of the biggest single inward investments made in Scotland's manufacturing sector for a long time." The firm said the investment would create new full-time jobs over the next 18 months to accommodate and fulfil the increased capacity. These jobs will be created across the organisation, but primarily in the operations team as well as in product marketing and innovation. Substantial building work will take place on the site to accommodate production equipment, including a 187-tonne furnace and curing ovens. Cooling, cutting and milling equipment will be replaced and an automatic packing system will be installed. Building work will start early in the new year. 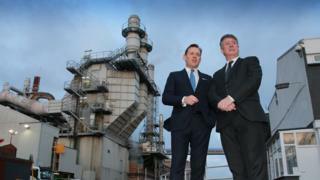 Economy Secretary Keith Brown, said: "This investment, and the jobs it will create, is excellent news for Stirling and for the wider Scottish economy. It rightly shows real confidence in the highly-skilled Scottish workforce. "It will help position the Stirling site to take advantage of greater opportunities in the future and will also help to deliver significant environmental benefits." Mr Brown also revealed the investment was boosted with a Scottish enterprise grant of £477,000.